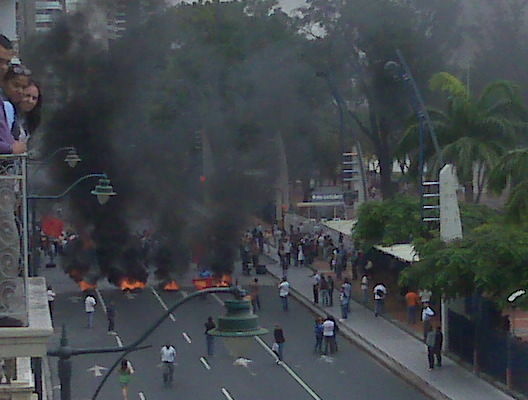 As of right now, Ecuador is said to be in the state of chaos. 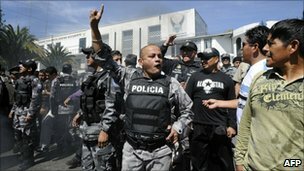 Last year Quito,also one of the cities with the highest violence rate, was on lockdown for the absurd amount of violent events that took place. During the police protest their President Rafael Correa was hospitalized from being hit by bottles. Along with that event there were many reports on fires loots and your general violence. I have found many articles on recent homicides, wondering where the special forces are and what they country is going to do about this issue. I have read that a women was shot at a stoplight, a merchant was killed right on the street, an assault of an assembly women and how a man was murdered all in the time span of about a week and a half. Now you must be thinking that well we live in America and those type of events unfortunately happen all the time, but Ecuador is ten times smaller than us and are apparently a bit more corrupt. When the incident at Quito accured, Iran had to come in and help because how else would Ecuador stay safe. This country, along with many other countries, have issues they need to resolve. Their people are angry with the way things, as in economy and such, are being dealt with. With all of this chaos, it is interesting to see how or what other countries are doing to prevent violence. 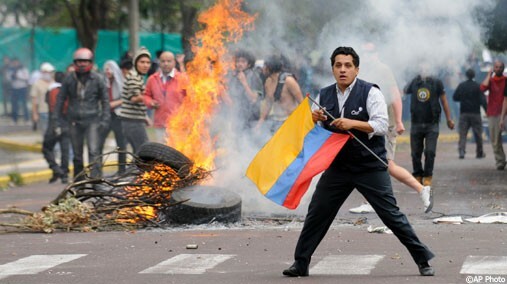 The United Nations is urging Ecuador to stop all of this violence. Ecuador needs to become one nation and solve this issue, otherwise it will go down hill.